From January 2011 - January 2013, I was on the executive board of Graduate Women at MIT. 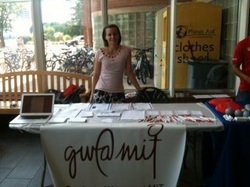 The student-led, institute-wide organization serves the needs of women in graduate programs at MIT. We have three flagship programs: a Leadership Conference in the Fall, an Empowerment Conference in the Spring, and a year-long Mentoring program. First as Secretary, then as Membership Chair, I worked to help run the every-day operation of the group, maintain our weekly e-mail digest, interface with collaborators across MIT and the Boston Area, and organize events to engage the community. Making Paper airplanes with girls in Wichita, KS. I presented for the MIT Women's Initiative, a group which educates middle school girls about engineering and encourages them to take math and science classes. I went to South Bend, IN for a week in Jan. 2010 and Wichita, KS in Jan. 2011. 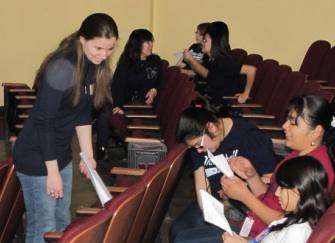 A partner and I talked to girls about engineering, our research, and our experience. We led a hands-on activity and showed the girls that engineering is a viable and rewarding career. I am a very adamant reader and am always reading something new. 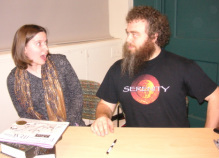 Some of my favorite authors include Patrick Rothfuss (pictured), Orson Scott Card, Douglas Preston and Lincoln Child, John Green, and Herman Melville. I am also involved in Harry Potter - Massachusetts, a literature group which focuses on book discussions and is a chapter of the Harry Potter Alliance, a volunteer organization which advocates for literacy.